It has hardly ever been so easy to secure music and thus repeatedly play the same material the same way. These possibilities of contemporary music reproduction are exactly what Karlheinz Essl defies. This inherent feature demonstrated ever so often in his improvisational performances is also used in his compositions, which is quite contrary to the conventional definition of composing. In this sense, Essl sets his works in a dialogue with tradition, but without letting his works appear traditional. For example, in his Lexikon-Sonate, for which he has been algorithmically formalizing musical gestures from the works of major composers such as Johann Sebastian Bach, Wolfgang A. Mozart, Schoenberg, Boulez and Stockhausen since 1992. The changeable parameters are transmitted through random structure generators on a self-playing piano and create a piece that takes a different shape at every performance. Inspired by the formalization of typical musical gestures, he widened his intention to the so-called Real Time Composition Library, which allows him, as well as other composers, to use these gestures in other compositional contexts. Thus, these are meta-instruments with which he creates meta-compositions - music about music, without being literally quoted. One of these meta-compositions is the cycle Sequitur, which now includes more than a dozen others parts for trumpet, flute and cello as well as electric guitar, accordion and toy piano. The concept refers to the sequence of Luciano Berio and shares a common exploration of the technical possibilities of playing solo instruments. 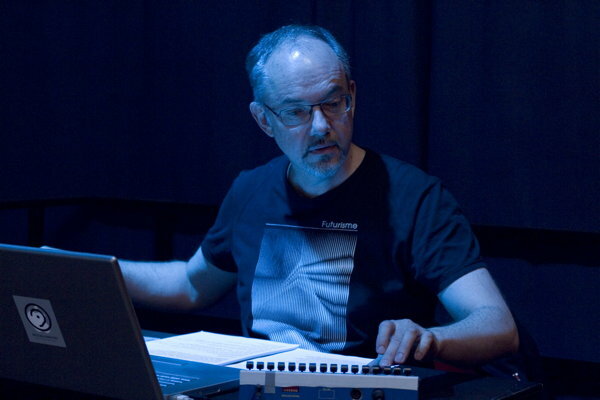 To extend the possibilities even more, Essl added a computer program that reproduces and electronically alters what the performer played, which allows him to interact with the music played before. Apart from these small compositions, Essl's creative work also includes extensive chamber music and orchestral compositions. He learned the necessary skills when studying composition with Friedrich Cerha (for whom he realized the electronic part in Cerha’s Spiegel III) and studying electro-acoustic music with Dieter Kaufmann. The trained double bass player also likes perform on stage himself, for instance when he performs his Lexikon-Sonate or his free improvisations. Although he doesn’t perform too often with his originally learned instrument, but rather performs with electronic devices and, occasionally, with a grooved part of a tree trunk, which he sets in vibration just like a percussion instrument and electronically changes it in real time. For this matter he also developed a computer program (called m@ze°2) between 1998 and 2010, that enables him to adjust various parameters, depending on the performance situation and personal preferences. Karlheinz Essl already discovered his joy of experimention in his youth at piano lessons, and his subsequent contact with Jazz surely also accommodated this passion. Perhaps that is where the skeptical view on the unchangeable comes from. He regularly organizes "blind dates", which are always unrepeatable listening events of the improvisational interaction between various musicians. In addition to composing and playing music, Karlheinz Essl also spreads his conception of music in other forms, such as teaching music at the University of Music in Vienna and curating concert series in the Essl Museum.